Arron Banks. Photo: Jonathan Brady/PA Wire/PA Images. All rights reserved. 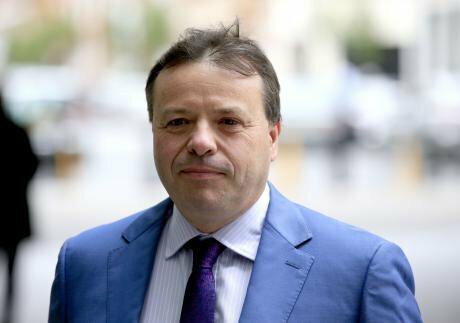 Brexit donor Arron Banks lied to MPs about the political work that his insurance company did for his controversial Leave campaign, according to whistleblowers who worked at Banks’s Bristol headquarters during the Brexit vote. Hundreds of emails leaked by former employees of Eldon Insurance and Rock Services to openDemocracy show insurance staff frequently working on the Leave campaign in the run-up to the 2016 referendum. Banks, who was referred to the National Crime Agency this week, repeatedly told MPs that his insurance businesses and his political campaigning were separate. Damian Collins, chair of parliament's inquiry into fake news and disinformation, said that the evidence appeared to "flatly contradict" what Banks told his committee in June and that Banks could have "deliberately misled the committee and parliament on an important point." “If Eldon employees were being paid to work on the campaign, it should have been a declared expense. We asked him directly if he’d used his insurance employees to work on the campaigns and he said they didn’t,” Collins added. Under British electoral law, campaigns cannot co-ordinate or ‘work together’ unless they declare their spending jointly. However, emails and testimony from insiders suggest that insurance staff in Bristol frequently worked not just for Leave.EU but also for other Brexit campaigns at the same time. This was not declared to the Electoral Commission, raising questions about whether Banks’s campaign could have breached electoral law (again). Eldon Insurance employees were directed to work for Banks’s Brexit campaign, contradicting statements made by Banks and his colleague Andy Wigmore in parliament. Insurance staff were frequently assigned to work on material for Banks’s Leave.EU and other Brexit campaigns. This work was not declared on submissions to the Electoral Commission, despite being a requirement of UK electoral law. Banks’s Brexit campaign amassed data from tens of millions of British voters through the UK electoral register. Former Leave.EU staff have raised questions about whether this data was destroyed after the referendum, as stipulated by British electoral law. The NCA is investigating whether Banks is the “true source” of £8m he provided to Leave.EU and Better for the Country Limited. We can report for the first time that Better for the Country had spent £1.5m by December 2015, two months before the referendum date had even been announced. Eldon and Leave.EU staff at Banks’s Bristol HQ also worked for UKIP at the same time, with Leave.EU’s office even depicted as a UKIP membership centre in a party magazine. Banks told parliament in June that he “never had a role” in UKIP. In June, Arron Banks told the DCMS committee that Leave.EU and his Eldon Insurance business were separate organisations with different staff. Leave.EU did not “use staff who had previously worked in the insurance business,” Wigmore told MPs. But employees worked across different political campaigns at the same time as working for Banks’s insurance company, according to emails and interviews with former Eldon and Leave.EU staff. An ex-Eldon insurance employee who worked at the company in the run-up to the referendum told the Observer today: “I made it absolutely clear that I didn’t want to work on the political stuff. I wasn’t comfortable with it. I didn’t want to be complicit in it. Some of these images were really horrible. The immigrants and refugee stuff. But there were always these urgent requests coming in. You were told to stop what you were doing and do something for Leave.EU or Grassroots Out or the GO movement. 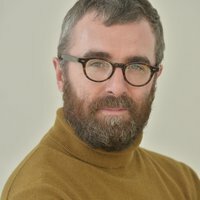 Banks, the self-styled ‘bad boy of Brexit’, has already been found to have misrepresented his connections with Russian officials and the value of his investments. As openDemocracy has repeatedly shown, huge question marks hang over the true extent of his wealth. This week the National Crime Agency announced it was investigating allegations of multiple criminal offences by Banks and his Leave.EU campaign. Banks has rejected the allegations and said that they are motivated by political bias. Banks has also recently boasted that he would use Leave.EU’s support base to unseat Conservative MPs he believes are not committed to a hard Brexit. Last week, he wrote to every household in the constituency of Damian Collins MP, calling the Tory chair of the parliamentary inquiry into ‘fake news’ a ‘snake in the grass’ and a ‘disgrace’, after Collins called for a Mueller-style investigation into Russian meddling in the Brexit referendum. Collins’s DCMS committee previously published evidence and testimony supplied by an ex-Cambridge Analytica employee Brittany Kaiser about how Leave.EU employees used Eldon insurance data to target voters. Banks denied these claims. The relationship between Eldon, UKIP and Leave.EU is one of the focuses of an investigation by the Information Commissioner into the use of data in the referendum. The final report will be published on Tuesday and the ICO head, Elizabeth Denham, will answer MPs inquiry in a hearing of the DCMS committee. Arron Banks has declined to answer any of openDemocracy’s or the Observer’s questions. Earlier this year, he denied to the Observer that any Eldon employees had undertaken any work for Leave.EU. Leave.EU has already been fined for breaking British electoral law during the Brexit campaign, and has been referred to the police for potential criminal charges. Without Leave.EU, according to Arron Banks, there would be no Brexit. In his autobiography, Banks claims that Leave.EU’s social media team was reaching almost 20 million people a week ahead of the 2016 referendum. The campaign was run by only around 30 staff on the top floor of Lysander House, a boxy glass-fronted building on the edge of Bristol that is also home to dozens of Banks’s companies, including Eldon Insurance. Here, around 20 junior Leave.EU employees sat by rows of phones, calling potential donors and supporters. Separately, a ‘political team’, directed by Banks, orchestrated the creation of controversial content for social media that was produced by a small pool of designers. When Banks appeared before parliament in June, he assured MPs that Leave.EU staff were “clearly demarked” in Lysander House and were separate from the Eldon insurance business based there. Banks’s sidekick Andy Wigmore told parliament that Leave.EU had not used “staff who had previously worked in the insurance business”. However, this supposed division between Leave.EU and Eldon insurance simply did not exist. Hundreds of emails and documents obtained by openDemocracy, and interviews with former Leave.EU staff, show that Eldon staff were intimately involved in the Brexit campaign. A longtime Banks employee, Pamela Palmer, assembled and managed Leave.EU’s call centre. 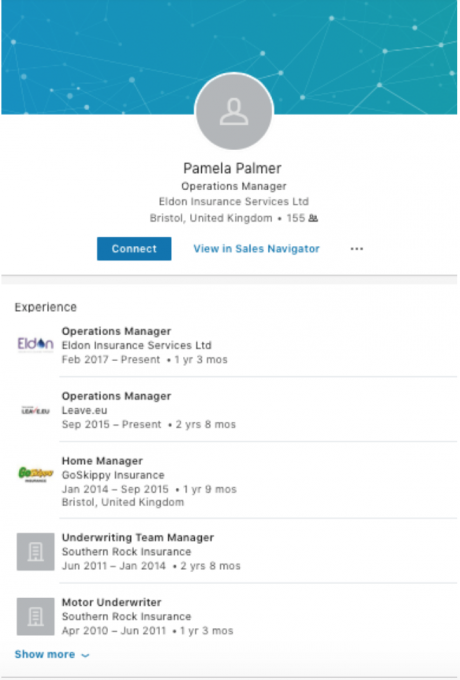 Palmer is listed on Eldon’s website as an operations manager, where she is quoted saying “I have been part of the Eldon team for a number of years.” Palmer was “in charge of all of us kids”, says one former Leave.EU staffer. In March 2016, Palmer wrote that she had received “1 million phone numbers and the members data”. Palmer had email addresses for Leave.EU, Eldon Insurance and theKnow.eu, a forerunner to Leave.EU bankrolled by Banks’s close associate Jim Mellon. Liz Bilney was listed as theKnow.EU’s CEO, and the campaign’s website encouraged supporters to enter their names, telephone numbers and addresses into theKnow.EU database. Another Eldon veteran, Holly Gardner, described herself as “project manager on secondment to Leave.EU”, which she lists as being a part of the Eldon Group on her LinkedIn profile. 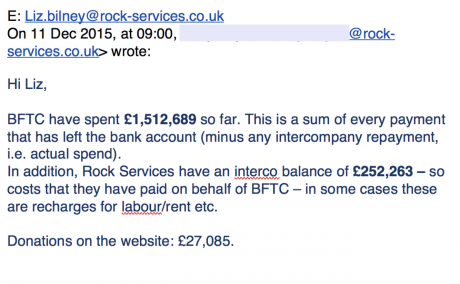 Many of those working for Leave.EU had email addresses belonging to another Banks’s company, Rock Services, which also paid their wages. Leave.EU was, and still is, based within Eldon Insurance’s Bristol HQ. Hundreds of emails show Leave.EU staff assigning political work to Eldon Insurance employees. Banks himself is included in some of this correspondence. Under UK election law, participants in political campaigns must declare any services that they receive during the campaign. Although our evidence shows Eldon staff working on Leave.EU work, Banks’s campaign did not declare any services from Eldon insurance in its spending return. “During the EU referendum, campaign groups could accept donations – including of services – from permissible companies, and could pay for services,” a spokesperson for the Electoral Commission said. Banks’s insurance staff were involved indirectly in the Brexit campaign, too. A few weeks before the Brexit vote, Banks invited a small group of insurance employees to view an anti-immigration video before it was posted on Leave.EU’s Facebook channel. In late May 2015, Banks created a company called Better for the Country Limited. Just weeks earlier, David Cameron’s Conservatives won a general election majority on a manifesto that included a commitment to hold a referendum on European Union membership. Better for the Country donated at least £2.3m to various Leave groups between February and June 2016, according to filings with the Electoral Commission. This week, the National Crime Agency launched an investigation into Better for the Country Limited and Leave.EU, after the Electoral Commission found that there were “reasonable grounds” to suspect that Banks was not the “true source” of cash he provided to both outfits. The Electoral Commission said that Better for the Country and Leave.EU spent at least £2.9m on Brexit, but our investigation suggests that the true figure could be much higher. Under UK election rules, only campaign spending in the final ten weeks of the campaign – the “referendum period” – needs to be reported to the Electoral Commission. The campaign could only spend up to £700,000 during this period. Leave.EU declared spending £693,094. But by December 2015 – six months before the Brexit vote and before the referendum date had even been set – Banks’s Better for the Country Limited had already spent more than £1.5m. In an email dated 11 December, Leave.EU CEO Liz Bilney is told that Better for the Country has “spent £1,512,689 so far”. This spending was legal but did not have to be declared to the Electoral Commission so this is the first time detailed information has been published revealing exactly how much Banks’s campaign was spending long before polling day. UKIP? Or Leave.EU? Or both? Before Brexit, Arron Banks was best known as UKIP’s biggest donor. In 2014, he pledged £1m to the party – although he ended up giving just over £400,000. During the ‘fake news’ inquiry in parliament, Banks distanced himself from UKIP. Asked in parliament how he demarcated his roles in UKIP and Leave.EU, Banks said that he “never had a role in UKIP”. But UKIP appears to have been very much involved in Leave.EU’s organisation. 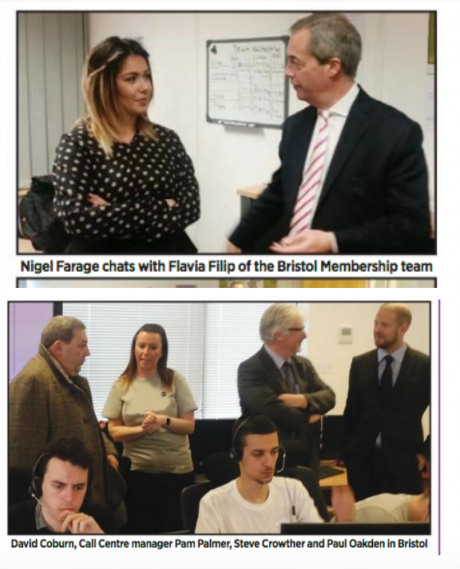 In February 2016, a UKIP magazine published a photograph of a visit to the party’s “Bristol membership office”. The photo is taken in Leave.EU’s office in Lysander House. Pamela Palmer is described as being the call centre manager. Another Leave.EU staffer is listed as “UKIP renewals leader”, according to emails obtained by openDemocracy. Her LinkedIn lists her employment at the time as a team manager at Eldon Insurance. Source: UKIP magazine, February 2016 That same month an Eldon insurance employee emailed Leave.EU CEO Liz Bilney asking whether “we will be sending out UKIP emails from our office.” Employees for Eldon and Rock Services worked on UKIP messaging materials, including mailshots to UKIP supporters, and messages from Nigel Farage. In May, Bilney was reported to the Metropolitan police for her role in Leave.EU’s numerous alleged breaches of electoral law. On Thursday, Bilney said she “welcomed” the National Crime Agency investigation, saying she was confident she and Banks would be exonerated. The source of all the personal information used by Leave.EU’s call centre to target voters from across the country is unclear. A former staffer said that the campaign had a database with names, phone numbers and emails. But Leave.EU team leaders seemed unsure of the source of the data. “You’d ask the team leader and they’d say Facebook or ‘I don’t know’,” an insider told openDemocracy. In March 2016, a few months before the Brexit vote, Leave.EU staff began asking for copies of the electoral register across Britain. Electoral registers contain a wealth of information about voters, includings names, addresses, and postcodes. Registered participants are allowed to request the registers ahead of an election. Leave.EU received registers from at least 64 councils, according to documents released to openDemocracy under Freedom of Information laws, but a former staffer said that the campaign received data from every local authority in the UK, which would include tens of millions of voters. In early June 2016, Leave.EU CEO Liz Bilney sent an email complaining that the campaign had only gathered records of 14.7million voters. “I’m shocked, we need all the data in,” Bilney told Palmer. Staff from Banks’s other companies were brought in to help with the mammoth task of requesting the details of tens of millions of voters. An email released to openDemocracy following a Freedom of Information request shows an Eldon staff member chasing Runnymede council for its electoral register. A junior Leave.EU staffer was tasked with formatting the electoral registers. A week before the Brexit vote, three Eldon temps were seconded to assist. All the data was entered into Excel and edited to ensure that it was all presented in the same format. Leave.EU staff who worked with the electoral registers said they did not know what happened to the data after the Brexit referendum, leaving open the possibility that it could have been transferred to third parties, including Eldon Insurance. The Electoral Commission says this information “should be securely destroyed” once the purpose for which it has been supplied has expired. Failure to do so is a criminal offence. In parliament in June, Jo Stevens MP asked Banks if any data gathered by Leave.EU was shared with his insurance companies. Banks replied: “I do not believe so”. Adverts for Banks’s insurance firm GoSkippy have often been sent to people on Leave.EU’s mailing list. Banks has previously defended the practice, saying: “Why shouldn’t I? It’s my data." openDemocracy also discovered that Eldon staff requested electoral registers on behalf of both Leave.EU and other Brexit groups. Pamela Palmer sent numerous requests for registers to councils for the register on Leave.EU. In a letter dated 5 April 5 2016, Richard Murphy, of Grassroots Out, wrote that Palmer was authorised to accept electoral registers on behalf of his Brexit group. 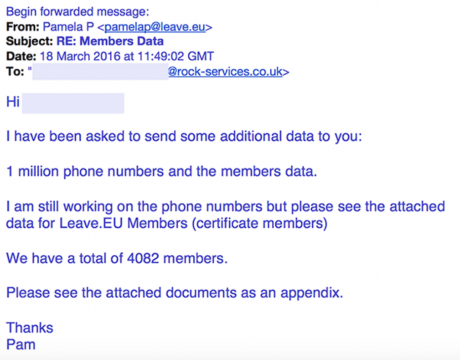 On 21 April, less than a week after the start of the official referendum period, Holly Gardner wrote to Pamela Palmer at Leave.EU with “attached GO data”. GO could refer to Grassroots Out or GO Movement, which were both registered Brexit campaigns that were led by Tory MP Peter Bone. Gardner’s email suggests that Leave.EU had access to, and was using, data collected by GO. On May 6 2016, just weeks before the Brexit vote, a ‘creative team leader’ at Eldon wrote to Liz Bilney to discuss the ‘hand over’ of the Grassroots Out website which was controlled by Leave.EU staff. Insiders told openDemocracy that they were continually asked to work on material for Grassroots Out and other Brexit campaigns, including UKIP. “I honestly couldn’t tell you what the differences were between the campaigns. We were just told to change the header or the footer depending on which campaign it was for but they were clones of each other,” the source said. Under UK election law, different campaigns must declare if they are “working together” during the final ten weeks of the campaign. According to Electoral Commission filings, Leave.EU and Grassroots Out were registered as separate campaigns during the Brexit referendum, which means they could not coordinate campaign activities. Earlier this year, the official Vote Leave campaign was fined for breaking its spending limit by coordinating with a smaller pro-Brexit campaign. Banks has recently pledged to use Leave.EU to push the Tories into a hardline Brexit position. "The best way to secure Brexit and our country's future is via the Conservative Party,” the Leave.EU chief wrote in the Times in August. "To that end, I am urging the 90,000 members of my Brexit campaign Leave.EU and the 1.4million who follow us on social media to join the Tories and have a say." Banks has sent tens of thousands of Leave.EU’s supporters emails and social media messages telling them to join the Tories. Letters on Leave.EU headed paper were sent to constituents of the chair of Damian Collins MP – including people who were not supporters of Banks’s Brexit campaign. openDemocracy asked Arron Banks where the data used to target Collins’s constituents came from, as well as numerous other questions. So far we have yet to receive a response. We also asked Andy Wigmore and Liz Bilney about the claims made in this piece. Neither have responded. Adam Cantwell-Corn of the Bristol Cable contributed additional reporting on this piece. This piece was edited on 4 November to reflect that Jim Mellon did not create theKnow.eu but donated a reported £100,000 to the campaign in 2015 and had pledged to give more.